The Cebek CD-30 module is a digital stopwatch chronometer with a maximum time of 59 Minutes, 59 Seconds. 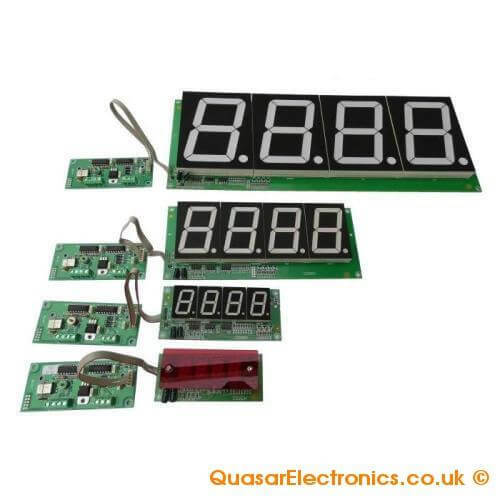 The 4 digit LED display is available in 4 different display sizes (13mm, 25mm, 58mm or 100mm high digits). The circuit is crystal controlled ensuring a high degree of accuracy. START/STOP - timer counts when input is closed and stops when open circuit. RESET - zeros and holds counter at 00.00 when closed. Counter will automatically resume counting from 00.00 when RESET is opened if START/STOP input is closed. Timer wraps around to 00.00 when 59' 59" is reached counting up and to 59' 59" when 00.00 is reached counting down. The display board is connected to the control board via a 20cm long ribbon cable.It has screw terminals blocks and reverse polarity protection. Range 0 - 59' 59"